​​​​ ​HOCKLEY, HARRIS COUNTRY – With its close proximity to Hwy. 290 and the Grand Pkwy., the rural Hockley area is beginning to encounter residential and commercial growth. 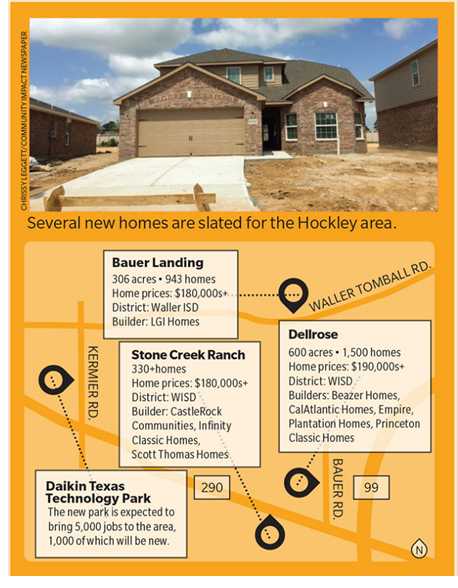 New master-planned neighborhoods, such as Dellrose and Bauer Landing, have already opened in the area in anticipation of the Greater Houston area’s expansion outward. More than 2,000 new homes are planned for both neighborhoods, according to developers. Daikin Industries, a manufacturer of heating, ventilation and air conditioning products, is one of the companies expected to spur growth in the area after opening a $417 million campus in nearby Waller in late May. Check out Houston Housing Market Research.